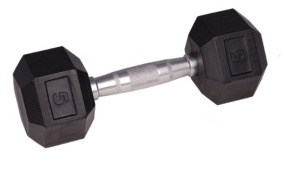 The modern single-handed Hex Dumbbell inSPORTline Hexsteel has versatile use. Its ergonomically shaped grip is made of high-quality metal and has anti-slip grooving so that you can keep your hold on the dumbbell even during intense exercising. The weight plates have especially durable coating to prevent wear. Thanks to its hexagonal shape, this inSPORTline dumbbell stays balanced and still when you put it down.